The intersection of Spring and Cross streets in Belfast. It is a mixed residential-industrial area. The city of Belfast will move forward with plans to overhaul the area and make needed infrastructure repairs. BELFAST, Maine — City officials reeled this week with sticker shock after learning a downtown revitalization project will be much pricier than predicted, then rallied to vote in favor of doing the improvements this summer anyway. The project would help transform a long-neglected part of the city designated in 2011 as a “slum and blight” area by the Belfast City Council. Two years ago, the city won a $500,000 Maine Community Development Block Grant to help pay for street and infrastructure improvements in the part of town between Main Street and Belfast Common, including Cross Street and parts of Spring and Miller streets. 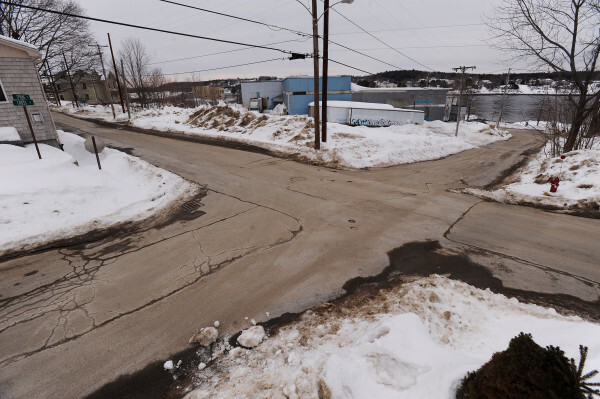 The city of Belfast so far has paid about $70,000 for project engineering and design, including fees paid to Sebago Technics, a South Portland-based civil engineering firm. Engineers from that company estimated the total costs for the project would be $600,000. But this summer, after the city solicited bids, they ranged from $900,000 to $1.2 million. “It way overwhelmed us,” Marshall said. So officials went back to the drawing board and retooled the project to find ways to bring the cost down, putting it out to bid again in late November. Sebago Technics again estimated the project would cost about $600,000, but when the bids came back in January, “again, we suffered sticker shock,” Marshall said. The lowest bid came in at $850,000 and did not comply with some of the grant requirements. To get the project done using the next lowest bidder, Maine Earth, will cost the city a total of $530,000 — more than double the cost local officials initially anticipated. The cost will not be borne by all property taxpayers but paid for via the city’s downtown-waterfront tax increment financing district. Councilor Mary Mortier said that revitalizing this part of the downtown will be important to the future of the city. Before they voted in favor of spending the money to get the work done, the councilors said that turning the grant down and sending the money back to the state would send the wrong message.